Observing phenology allows you to connect with the natural world around you. The USA-NPN invites citizen scientists to track the phenology of plants and animals through Nature's Notebook, an online plant and animal phenology monitoring program. By participating in phenology monitoring, you will develop a better understanding of nature, contribute to a national database used by scientists and resource managers, and have a lot of fun along the way! 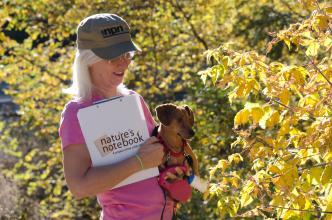 Chris Nielsen started using Nature’s Notebook to observe native plants in the Northwest several years ago. Chris not only monitors plants at his home, but also at the Kruckeberg Botanic Garden in Shoreline, WA. What does Chris recommend for getting started with Nature’s Notebook? Don’t take on too many plants! Start out with just a few and stick with them over the years.